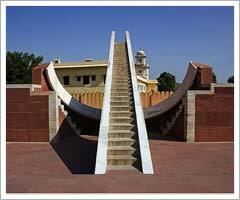 Jantar Mantar has a remarkable collection of architectural astronomical instruments. It portrays noteworthy attempt of the ancestors, who were fascinated in astronomy and knowledge of extraterrestrial bodies. Above all, this observatory still, provides accurate information, which can be compared with today's modern instruments indisputably. The compound instruments, whose settings and shapes are scientifically designed depicts the forte of Medieval Indian Astronomy. Between 1727 and 1734 Maharajah Jai Singh II of Jaipur constructed five astronomical observatories in west central India. The observatories, or "Jantar Mantars" as they are commonly known, incorporate multiple buildings of unique form, each with a specialized function for astronomical measurement. He built the first stone observatory in 1724 in Delhi. The Jaipur observatory was built in 1728. There is actually a fascinating story in relation to the construction of the Observatory. According to the story, Sawai Jai Singh II sent his envoys to various parts of the world. The emissaries came back with manuals and astronomical tables besides tons of data on the advances made in the fields of astronomy. La Hire's "Tables" was one of these manuals, and overwhelmed by it, Sawai Jai Sing II ordered the observatory to be constructed according to the data available in this manual. Amazingly, after Jantar Mantar was built, it was discovered that the Observatory was more accurate than the Table itself.